So dictates Seattle code. 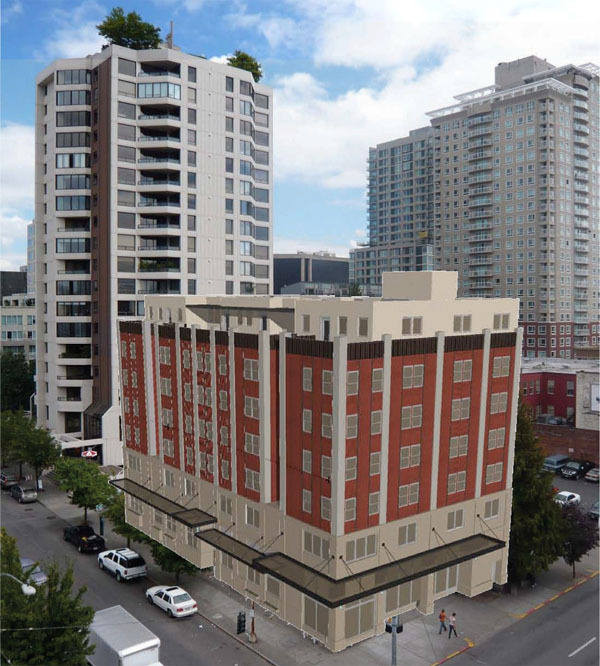 But as far as I know, only one new significantly sized project has yet to take the cue: Plymouth Housing Group’s proposed seven-story mixed-use building at 1st and Ceder (unflatteringly rendered above), scheduled for completion in 2010. 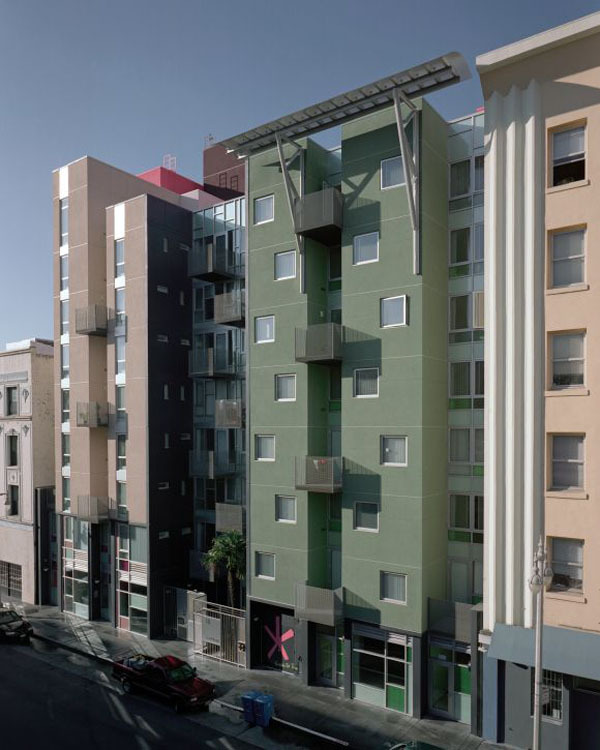 Designed by SMR Architects, the building is to provide 84 studio residences for the homeless, along with 2000 square feet of street level retail. Given the clientele, the undoubtedly tight construction budget, and the excellent access to transit, no parking makes several kinds of sense for this project. As for no parking in market rate housing, well, let’s just say we’ve got a whole lot more CO2 to emit from our cars before that’s going to happen. In Seattle, ratios as low as about one space per unit are becoming more common. The lowest I’ve come across is Moda, in which 83 of 251 units have no on-site parking. In a Portland condo project called The Civic, 24 of 261 units were set aside to be sold without on-site parking spaces. Cars and lenders are not about relent on their collusion to maximize parking any time soon. But given that below grade structured parking typically costs about $40,000 per stall, and given that we have a shortage of affordable housing in Seattle, and given that we all know that the sun is setting on the age of oil, the least we could do is start removing minimum parking requirements in Seattle city-wide. Downtown was a good first step, but because land costs are so high, projects are more likely aimed at high-end markets, which demand, and can absorb the additional cost of structured parking. Miniumum parking requirements were recently removed in Seattle’s four urban centers and the light rail station areas–very good moves. Why not urban villages too? And how long before we move toward parking maximums? Posted by dan bertolet on	Wednesday, December 3rd, 2008 at 10:40 am. You can follow any responses to this entry through the RSS 2.0 feed. You can leave a response, or trackback from your own site. I do have a slightly better constructed rendering, so contact me if you’d like a copy. Another note: no parking made a lot of sense for this site. 60′ wide sites are very difficult to “park” with any sort of efficiency and Seattle is FILLED with with 60′ wide sites. I might be crucified for saying this, but I think that this perspective is backwards. But this is just an uninformed lay opinion, and I really just want a discussion rather than to flame people. My opinion is that you need to have an excellent public transport and transit system in place before you can make an appeal to improve density and car dependence. My suspicion from avidly reading your blog for a long time is that you support what I consider the opposite idea – that you build the density and make things hostile for cars first, and then the transit will come. Personally, I think that the american addiction to cars is so ingrained that to break it you need to build a wicked non-car alternative to break the addiction. If you do this then the demand for no-car buildings and pedestrian friendly environments will develop naturally and the virtuous cycle will develop. My perspective is born from living in Sydney for 6 years, more than half of them without owning a single vehicle. My brother in law is in his mid thirties there with no drivers license. This is possible because of the transportation options available there, and where transit allows it, people can live without a car in Sydney. But even in this transit paradise, they build stuff with parking where the trains or buses are weak. Where do you lie on this? Do you believe that Seattle public transport is ready for no parking buildings (I think that Seattle public transport is poor)? Do you think that it will get better if lots of people have nowhere to park (I think that parking has been horrible in the 8 years that I have lived here, and the public transport never got better)? Now, what will it take to galvanize folk to get out of their cars? I take Mr Bertolet to think making cities hostile for cars is the way to galvanize support for transit. I may not agree, but I don’t know what the alternative is until peak oil kicks in (and we have folks ardently working on non-fossil fool cars as we speak to keep auto dependence going). So I have to support these efforts, while also supporting alternate efforts as well. [Ben] Since you’re opening this discussion I’ll jump in. The best cities I’ve been in have no cars in their core. This increases density by many times when you remove wide streets, parking places, parking garages, driveways, highways, etc. Why is density good? Because once you get past a certain point you don’t even need transit – you can walk to the grocery store, your office, your child’s school, etc. Yes, if you want to travel then you need to hop on a train (sigh) or I suppose in the US case rent a car. Now I consider such a city the far end goal. But we’re starting with a city built for cars. How do we get there from here? Good transit will certainly help build density. But nothing builds density like simply building densely. Remove parking minimums, stop building wide roads, build smaller housing units, and assuming you do all this within market demand, then you suddenly have a more dense city. New buildings without parking don’t make sense throughout the city, but I think this model of providing low-income housing on small lots without parking makes sense. I’d much rather that three adjacent lots be replaced over time with three no-parking structures than for a developer to buy all three and then build a half-block long condo monstrosity with parking that turns half the street into an urban monoculture. Obviously, low and no-parking development is only possible in areas with good transit. As for the big condo projects that add density but also design conformity and lots of new parking, the place for them is on arterial streets outside of the urban core that currently have surface parking, big box stores, and/or single-story strip malls. Each neighborhood can add density on its own terms, while retaining its individual character. The problem with a one-size fits all strategy is that it creates the numbing sameness of the kind of developments we often see in this city. Lifting parking minimums city-wide is one blanket policy that’s a good idea, though. Maximums don’t often make sense, but minimums never do. I live quite happily in Seattle without owning a car, but I use Zipcar (nee Flexcar) and traditional car rental when necessary. I don’t know the perfect ratio, but a couple dedicated car-sharing spaces per building would be a lot better than everyone owning their own car. But nothing builds density like simply building densely. Remove parking minimums, stop building wide roads, build smaller housing units, and assuming you do all this within market demand, then you suddenly have a more dense city. VAIL, Colorado — Just how much parking do Vail, Colorado seasonal employees need? It’s a question the town of Vail is asking as it considers requiring less parking for future employee housing developments and allowing developers to provide for transportation needs in other ways, such as building bike paths or contributing to the bus system. Right now, parking requirements are the same for employee housing and single-family homes and is based on square footage, said George Ruther, Vail’s community development director. Employee housing projects usually end up having 1.5 to 3 parking spaces per apartment. However, employees who live in “dormitory style” housing such as Middle Creek Village and Timber Ridge in Vail, often own fewer cars than a typical family, Ruther said. Town officials said they think separate requirements are needed for employee housing projects, so that land can be better used for housing. Less parking might also help keep employee housing affordable. A critical policy here is not parking maximums, but mandatory decoupling of parking. That is $400 per month per space must be paid by the user. If it’s apartments, the parking is rented separately from the unit. If it’s a condo, the association owns the parking, rents it to the members who want it and deducts the revenues from everyone’s dues equally. I say $400 per month, because that’s how much it costs to build. Anyone who is renting an apartment with underground parking right now, $400 of your rent (or mortgage) is going to pay for that parking space. Now, how much sense does it make to go car free if you have to pay for the parking anyway? But if you could save $400 per month on rent, or mortgage by going car free, then that might be something that people outside the ranks of desperately poor might consider. Parking maximums are a heavy-handed solution that will create unintended consequences. If (and only if) the users pay the full marginal cost of parking, then and only then, will we see what the true market for urban parking is. One last approach, and this may sound counter intuitive, is for the city to build public parking structures in the urban centers. The key again is to charge the users the full cost of the parking. This could then allow developers to build parking-free buildings, yet the tenants could still own cars and park them in the public structure in the neighborhood. The problem with building parking into the buildings is that the ratios are built to today’s market, but as Dan is fond of pointing out, tomorrow’s market may be very different. The problem is, when demand for parking falls in the future, you can’t unbuild it out from underneath the buildings. Consolidate the parking into a separate structure, and when the demand falls away, you can tear down one structure and repurchase the land, perhaps as a park. This sort of thing is not possible if the parking is built into the buildings. Tony’s got a good point with the decoupling of parking. However, I don’t think that people would necessarily pay $400 a month less for rent. If the building was being constructed by a non-profit, a gov’t agency, or other organization in which affordability is the basis upon which they judge their projects, then perhaps. But generally developers look at market rents, and then put a monetary amount on either amenities or detractors and arrive at what they think they can rent for. The “no parking” detractor is definitely not worth $400 in the market. It’s probably in the range of $50-75. Not saying you shouldn’t do it – just saying that’s not the way most developers/property managers would approach pricing. Tony has some great ideas. Consolidated parking has more perks than mentioned – you can design roads more efficiently, since you don’t need easy car access to each building. Also, you can site transit stops at such a building and also use it as a park-and-ride (though one you pay for). Regarding decoupled parking, it wouldn’t be tough to write a law that mandates the amount a site has to charge for parking – this could be based on construction cost, land value, or an average construction cost. But just enacting a mandate for decoupling parking and housing would be a good start (even $50/month might get people to own only one car). Typical real estate finance generally requires the sum of the rental income stream to add up to the full cost of the project with 10 years (often less). Assume 10 year payback for easy math. This means that if a project costs $25 million, then it needs to generate about $2.5 million in revenue per year, or about $100,000 per month ($25 million / 10 yrs / 12 months per year). Now let’s take this math down to the individual parking space level. If the cost of a single underground parking space is $40,000 as Dan suggests, then that parking space must command $333 per month, every month in order to pay for itself. Joshua is right, developers and property managers don’t look at costs, they look at market rents. If the market is only willing to tolerate a $75 premium for a parking space, then the decision to bundle the parking space amounts to a $258 net loss per month. This presents a huge arbitrage opportunity. If people only value parking at $75, the developer could drop the price by $75, not include the parking and still rent the space, but by doing so, the developer would save $333 dollars per month. Thus they could earn supernormal profits of $258 per month per apartment. If this were true, and I suspect it is, then eventually, some developer is going to figure it out and start making a killing on no-parking apartments and condos. Once a few demonstration projects happen, others will follow. Joshua’s analysis leaves out the issue of a downward sloping demand curve. The market may only commands a premium of $75 per space AT A PARKING RATIO OF 1:1. That is, you have to cut the rate to $75 if you want everyone to buy one. The $75 represents the premium placed on parking by the marginal user, i.e. the person who values parking the very least in the building. Push the price to $80 and that one guy won’t buy it, but everyone else will. Push the price to $400, and I’m guessing that at least half the people in the building won’t buy, but the other half will. Thus, if you put a $400 premium on the space, people will pay and you will sell all the spaces if you build half as many spaces. The more scarce the resource, the higher the price. It costs what it costs, and any time you have a price that diverges from the true cost, you’re burning money. If supply were better matched to demand, you would have a win-win situation, the cost savings would go to the developers who make higher profits in the short run, but then the surplus would be transferred to consumers in the long run as competition drives down prices. Now that government interference in the form of parking requirements has been removed, I suspect that the decoupling will happen slowly over time via market forces. I suggested that we mandate the decoupling simply to accelerate the process and avoid the construction of more and more inefficiently over-parked buildings while the market slowly comes around. Oh, and one more thing (sorry, rational parking policy is one of my favorite urban topics). It seems bizarre to me, as dan alluded to that we have removed parking requirements in the one place where parking is actually already scarce: the urban centers. In reality, it seems like the most obvious place to remove parking requirements would be single family zones. The density is so low in SF zones that there’s usually enough street frontage for each house to park two cars on the street. SF zones are the one place where you actually don’t need any off-street parking. Same principle applies as above: take the $40,000 you would have spent adding on a two-car garage and get an extra 800 square feet of house, or just lop it off and pocket the difference. Initially, developers will still build with parking out of habit, but over time the market will adapt once you get these counterproductive policies out of the way. Of course, if I had my way, I’d push the market along, but in the absence of good policy, no policy is better than bad policy. My house has no garage. But then there wasn’t much demand for them in 1904. Oh wait, and they were building a streetcar line within a few blocks. It’s strange to live in a city that used to have everything figured out. Tony reminds me that I was in Atlanta a couple of weeks ago and their downtown is starting to have a hard time. We saw three different (ugly as h*ll) newer parking garages slashing their monthly rates to $75. I subjected Sara to a short urban finance tirade about how $75/mo isn’t paying the note on those spaces, and what is going to happen to the companies owning the garage, etc. Anyway, I like the centralized parking idea above, but garages are expensive to build and tacking on true cost may take rents past equilibrium. Now we are back to incentives or abatement or something, and here we are again subsidizing the automobile. On requiring parking in SF zones: I once spent a summer living in an apartment that had been converted from a garage in what I suspect was an SF zone. It was not the world’s finest apartment, but it was the lowest rent I’ve ever paid — well less than half what I would have paid for an apartment in a normal apartment building. Right now, the main impediment to converting a garage to a mother-in-law apartment is the off-street parking requirement (the city requires one off-street space for the apartment and one for the house, IIRC). If we could relax the off-street requirement, we’d probably get a decent amount of affordable housing (while the payments could help homeowners pay increasingly unaffordable mortgages). As Tony points out, most SF neighborhoods have plenty of parking available (and I suspect the folks living in converted garages are less likely to own cars than the population at large). This seems like a no-brainer. Is there really that much parking fear out there? Excellent discussion you guys have going here. I love the decoupling of parking spaces idea, I am the proud owner of a parking space which I cannot put a bike rack on because of a condo association rule declaring bikes as a storage item and not a transportation vehicle worthy of a parking space. Anyone need a parking space in the Seattle U area? Hmm, probably not the best place to advertise a parking spot? I also like the potential of this relaxation of parking requirements in SF neighborhoods. Promoting affordability in both the rental market and ownership market, increasing population densities, and promoting car light living in Seattle’s many SF neighborhoods. Wow, all with just one, albeit controversial, action. Tony, et al – Yes, there’s some great thinking going on here. An additional thought re: decoupling parking: You can’t ignore retail. While some/many residents may be all for parking off site, retail tends to be very touchy when it comes to providing parking. The new “vertical” concept is new to many of them, and they are generally resistant to counting any off-site parking towards their parking calculations. This will take some time and hand holding, but getting them onto the bandwagon as early as possible would be necessary in mixed-use, non-downtown areas. Required parking spaces are directly relevant to the transit service in the neighborhood. Frequent transit that goes to useful places (not just express buses to/from downtown, but to local business/services) allows you to remove or reduce parking requirements. Infrequent transit service requires a higher parking requirement. This incentivizes all monied parties involved to both build on transit routes and create more transit routes. On a slightly different note, what if the next billion we put into alt energy creates a workable, affordable ZEV? There is essentially no important environmental impact to such a vehicle, removing that argument from the conversation about parking spaces and mass transit. Where will we park all those things? [David] Even zero emission vehicles take up space – for parking, roads, etc. A dense city without these needs is much more enjoyable and sustainable. I don’t think we’ll ever get there in Seattle, but we can come close. The fact is that we have far too much infrastructure for cars here even if cars were benign. There are many other important factors then simply the emissions of a car. As Matt points out these vehicles still take up space, meaning more pavement instead of natural foliage. Also, parking means more construction for garages and the like, which also causes environmental degredation. Also keep in mind that people have realized the detrimental effects of cars before the environmental movement really took off. Read some Lewis Mumford or Jane Jacobs who wrote about the problem with cars in the early 60’s. Car culture promotes unhealthy citizens, more dangerous neighborhoods (from car accidents and fewer eyes on the street) and in general a less coherent community indentity, which means neighborhoods lack the ability to effectively vocalize their needs and wants. As we’re on No Parking Baby | hugeasscity, Of course you’ll most probably have general overhead lighting within the nursery. For night-time feedings and quiet time with your baby, you may want to add a nursery lamp for more gentle lighting. This will help keep late-night disturbances at a minimum and help your child get back to sleep faster.